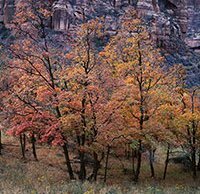 Large format film photographer Ben Horne has published his third video from a recent fall trip to Zion. If you missed his first two videos from Zion, click here and here. Horne has travelled to Zion multiple times and enjoys revisiting scenes to see how he has grown as a photographer. He enjoys trying new scenes as well, of course. As always with Horne's videos, it's fascinating to see a large format film camera in action. You simply don't see them very often anymore. They're very large and heavy, which makes them a challenging choice for landscape and nature photography, but Horne makes it work. In the video below, he's photographing some colorful maples in Zion and he walks us through his thought process and composition. In the first scene, he exposed two sheets of Velvia 50 film with his 8 x 10 camera and worked to capture the warm morning glow. It's interesting to note how different a film workflow can be compared to a digital workflow. I can't imagine capturing just a pair of shots of a scene I enjoy, but digital obviously affords a much different approach to shooting. At his next location, Horne opted for a vertical composition, which he notes is unusual for him. With his camera tilted a bit, he will lose some focus at the top of the scene with his 8-second exposure at an aperture of f/45, but it should still look quite sharp from front to back. To see the rest of Horne's shooting on his third day in Zion, check out the video below. To see more videos from Ben Horne, head over to his YouTube channel. To see more of his work, check out his website. He also has a 2017 Portfolio Box Set available for preorder.